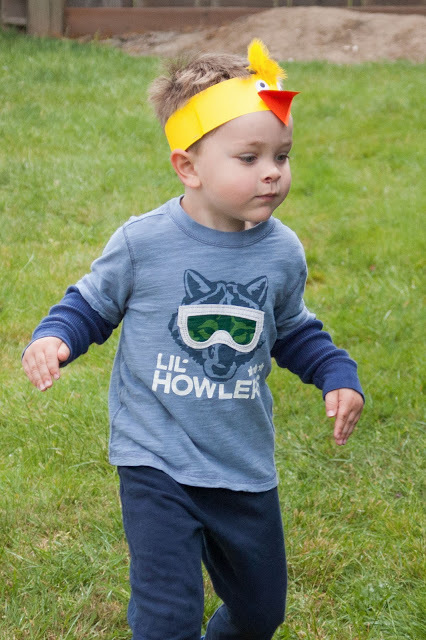 Mom with a Dandelion in Her Hair: Why is Preschool Even Necessary in a Homeschool Family? Why is Preschool Even Necessary in a Homeschool Family? We homeschool our three boys. The older two boys are only two years apart and Peter, the middle child, never saw any reason why he should not do what his older brother was doing. So the two boys are at approximately the same grade level on many things. I can pretty much teach the same thing to both boys with only slight adaptations for attention span. You would think, that because I am only teaching children at two different grade levels (older boys and preschool) that finding time to schedule in preschool would be easy, but it is NOT. I can't imagine, how a homeschooling Mom could do preschool and multiple other levels of teaching at once. When I get overwhelmed preschool is typically the first thing dropped from our schedule, I mean, is preschool really necessary? Preschool is necessary and for me the number one reason is - time. One on one time with my child. I am so fortunate to receive Mother Goose Time in exchange for writing about our experiences. However, even if I had to pay for Mother Goose Time, I would somehow find it in my budget to buy at least ONE box and here is why. My kids have never been ones to sit on my lap and enjoy a book, they were too busy for that sort of thing. And we all know all the studies that show how important reading with your child is to their development. Much of what I have heard from those studies is that it's not necessarily the reading part but the time of closeness with your child while building vocabulary. This is where Mother Goose Time saved us - quality time together exploring, learning and building vocabulary. When you buy your first box of Mother Goose Time you get a Welcome Kit with all you need to set up a stellar Circle Time display. Every morning you can spend time with your child discussing the weather and what clothes they should wear, putting up the calendar piece, singing about the days of the week and the months of the year. Just a walk down memory lane. This is when Lachlan was little and we were having some fun with Mother Goose Time. Then you get to dive into the Daily Discovery Bags. There are 20 in each box meant to last you one month. But you really can pick any topic you think your kids would be interested in and take as long as you want to work through it. The calendar pieces can be used over and over again if you adhere them with poster tack so you can make the 20 Discovery Bags stretch as long as it works for you. Each box introduces three letters, two numbers, a shape and a color. So in your box you will have activities that really hone in on those things each month. What this means is that if you just buy one box, you won't get the complete set of alphabet letters, and numbers. But you can always buy a set of flashcards if that is important to you and use some of the teaching techniques you will learn from MGT to introduce the other letters and numbers. This year though, you will get all the colors and shapes which came in the Welcome Kit. You also get an alphabet strip to put on your Circle Time display. 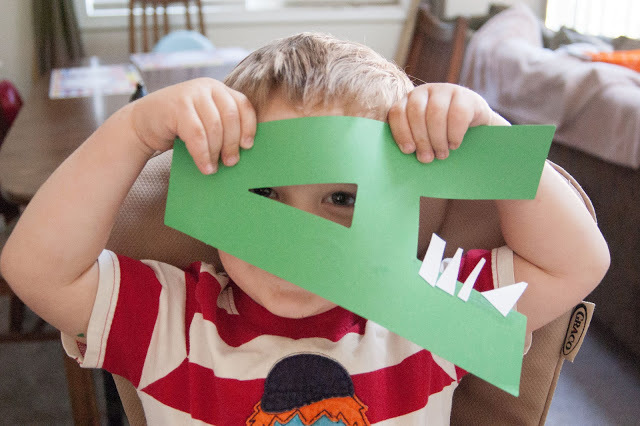 Tiny Peter learning about Alligators and the letter A. But I personally, wouldn't be too worried about the letters. 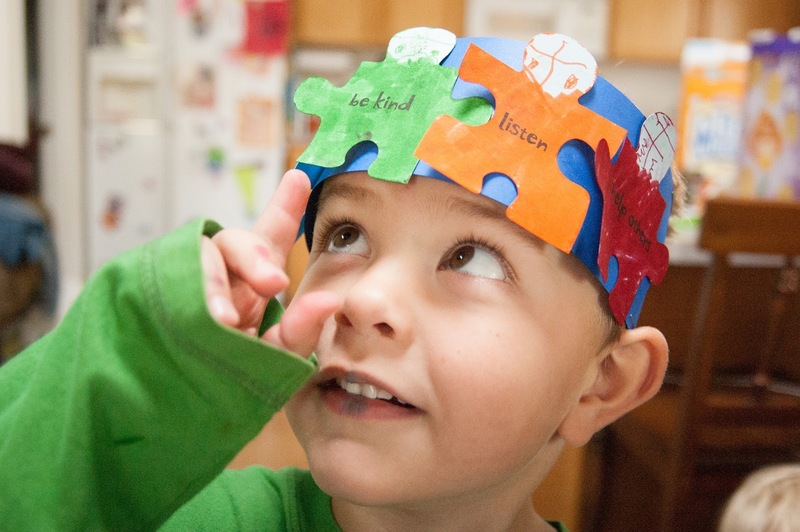 There is so much more to preschool than learning your ABCs and 123s. In fact, many homeschoolers choose to homeschool just to allow their children to be able to slow down in those areas and just enjoy being a kid and exploring. That's what Mother Goose Time is so good at!! They cover so many amazing and wonderful topics, far MORE than just letters and numbers. They follow all the current best practices and are constantly doing their research. 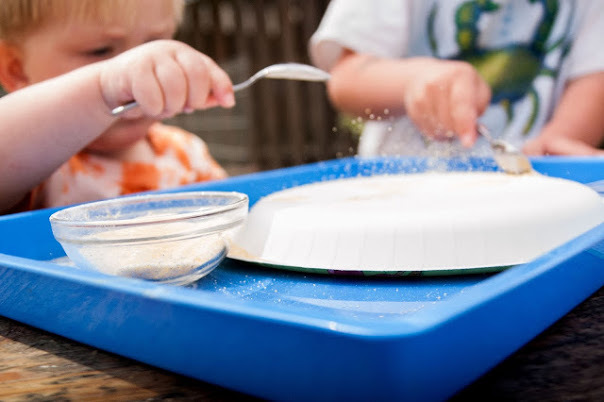 With this curriculum everything is explored through a multi-sensory approach full of fun and play. Now back to the goal of time with our kiddos. We all want to spend quality time with all of our children, but it can be hard with so many demands on us as educators, homemakers, wives and mothers. This is why, when the moment comes and you can grab a Discovery Bag and explore with your little one, Mother Goose Time will instantly be worth it's weight in gold. I am speaking from personal experience here. Life has been busy and hectic lately, who am I kidding, it always is. We have been diligent at getting school done with the older boys but not very good at preschool with Adam. But on this day, Adam hopped up at the table as his brothers were working on school and asked to do something too. It was easy, I pulled out Day 1's Discovery Bag from the Weather All Around Us theme. 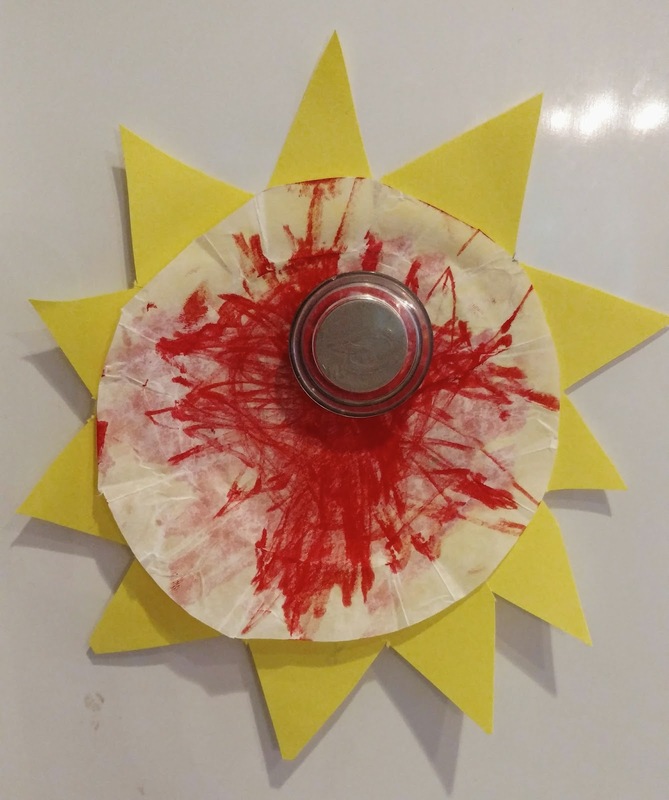 We jumped right into the Make & Play craft with the goal of making a sun. Everyone became interested in the craft, some might say distracted. But it was good for us to work on a project like this together and we still got all the other school done too. Peter and Lachlan heard we were making a sun and had to make a re-creation of the solar eclipse which is still fresh in our minds. Adam colored his "sun" blue and then I showed him the technique they used on the example of using the small souffle cup as a stamp. Lachlan made a sun on one side and the moon on the other. Adam grabbed the large souffle cup and cut the edges. He really enjoyed exploring every detail of the materials that were provided for us. As they were working I got out the Circle Time display and got it all updated. I grabbed the first letter from this month which was in Day 2's bag and put it up. Then I made my letter station on the fridge. This is the letter magnet set by Leap Frog and the Muscle Movement cards from Fundanoodle. Adam loves to explore this station and really enjoys learning his letters. I put up a new letter every few weeks following the MGT schedule, but you can easily do this on your own. If he pushes on the magnet it sings a song that helps him learn the sound that each letter makes. Then, if he wants to take the time he can trace the letter C.
After that I said today's date and we counted to 9. At this point Adam went to the bathroom and I thought he just had to go potty. But it turns out that what he was doing was washing the blue off of the souffle cup because he didn't want it to be blue anymore. He came back to the dining room in tears that he had ruined his paper. Poor guy. Thankfully I had another large souffle cup that I was able to trim down to be small like he wanted. Then he colored it red instead of blue. He looked up to give me a nice smile but he was not going to stop coloring for nothing. The older boys were now done with their MGT craft and back to business. They put their reading glasses on to get started and Adam decided he wanted reading glasses too. He was doing his reading after all! This I Can Read book was in last months box. We love all of these little readers which have repetitive phrases easy for little ones to pick up and they each include some of the most commonly used words that the kids can pick up as site words, long before we realize they have the ability. To make Adam feel happy and included, we got out an old pair of sunglasses and popped out the dark lenses. I think it worked. Next he hopped up on my lap to read his book. 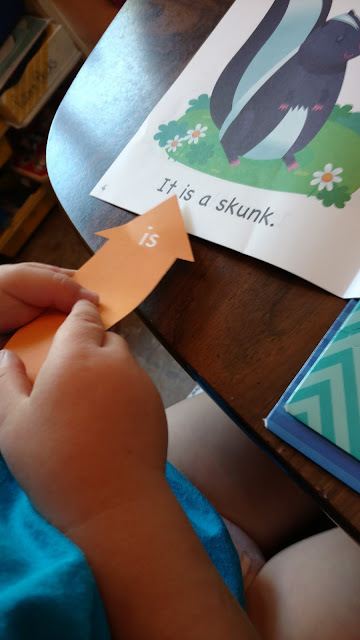 He grabbed a word pointer and he found the word "is" as we read through the book, which we did at least three times. After the first time he would hush me as I tried to read and said "no, I read it." Okay Dude, go for it. When he reads it, the words aren't always perfect, but he tells one heck of a story and that is such an important part of the process of reading. The last thing I did was to write his name on the provided nametag, in a thick yellow marker. Then I left it at his spot at the table with a thin red marker sitting next to it. He knows what his job is now, because we have done this a few times. He follows the yellow lines with his red marker as best as he can. If this was my one box of Mother Goose Time that I could fit in the budget, I would write his name in yellow, then laminate it and he could practice writing his name everyday using a dry erase marker. Later Adam asked for another nametag and he drew a perfect square and then rectangle. Inside the rectangle he drew a bunch of lines which he explained to me as "all of my family standing up!" We had so much fun! And it took me about 2 seconds to prepare. Well I guess I haven't ever timed myself to find out how long it takes to cut open a Discovery Bag, but I think you get the idea. Preschool is necessary for so many reasons but for me the most valuable of these is this quality time I get to spend with my children! That's what being a Mom with a Dandelion in Her Hair is all about. And I just have to give you a quick recap on me. I am not a crafty person, I am not an amazing homemaker that makes all the other Moms jealous, my house is not spotless, my children are not always clean or dressed, I do not spend hours a day planning lessons. With out Mother Goose Time, the reality is, my poor little man would be left out. I wouldn't have the time to collect all the resources to do these things with my kids. I mean, where does one purchase a souffle cup anyways? ?